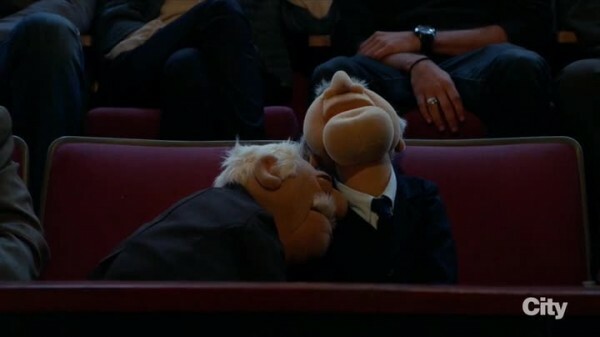 The Muppets returns with a strong followup to their pilot episode, and without the burden of the setting up the premise and the uncomfortable dating reality, they can get right to the wacky jokes and hijinks ensuing. 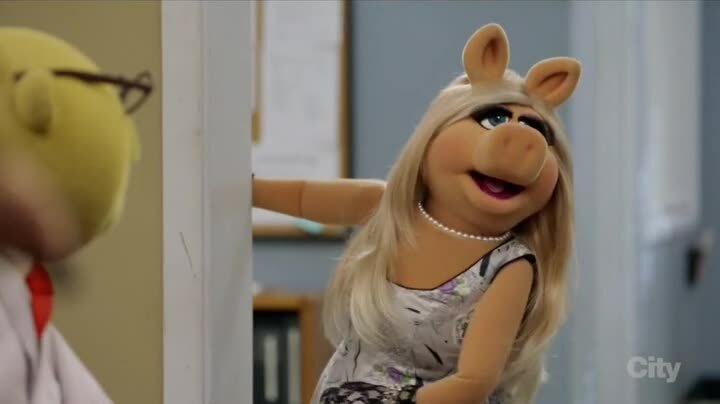 Miss Piggy is on the rampage lately, because she doesn’t have a date for an upcoming award show. 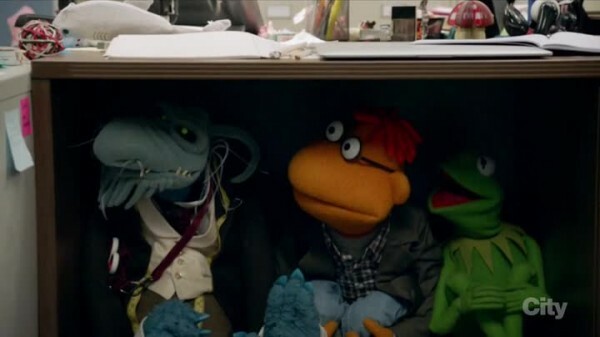 Kermit has the solution: set her up with Josh Groban and have some peace at the office. This works a little too well, as now Josh Groban is in a position to offer suggestions for the show. Suggestions Miss Piggy is more than happy to force Kermit to implement, even if they mean the show’s quality nose dives into the crapper. 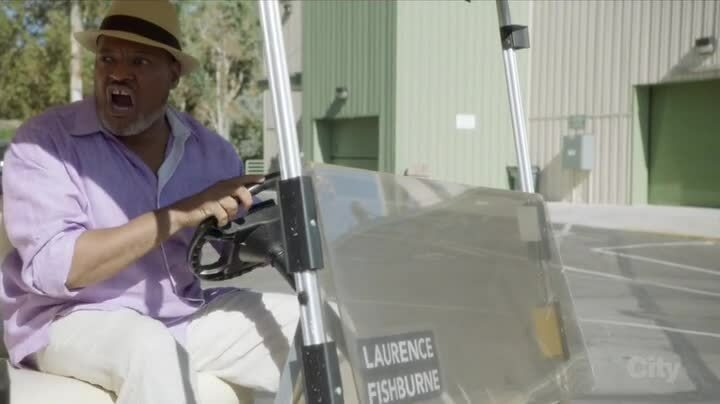 Laurence Fishburne has a hilarious cameo complete with some sick burns (sick Fishburnes???) on the state of Miss Piggy’s show. That is enough for Kermit to step into action and try to de-Groban the area. 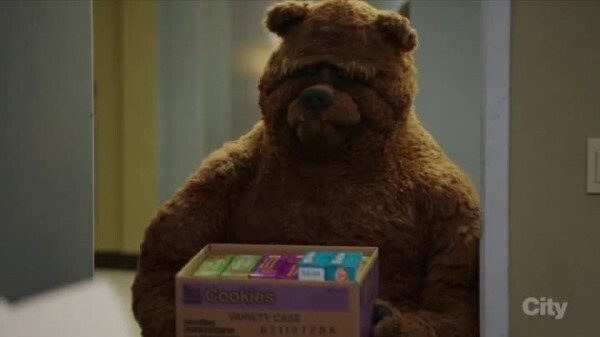 The other b-plot is Bobo the Bear selling cookies for his daughter’s Girl Scouts troop, which becomes a running gag when the Newsman appears as a rival dad also selling cookies and is infringing on Bobo’s territory. This one worked better because it could be integrated into scenes at the office and ended with the obvious but hilarious solution that will make Bobo a hero to his daughter. 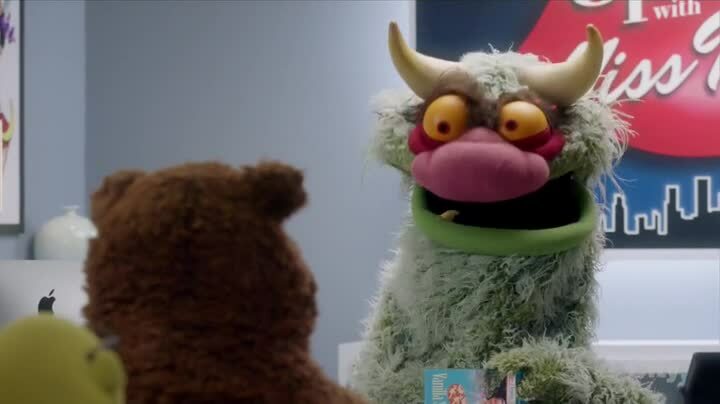 Uncle Deadly get more than a small cameo as the costumer, and has a great line about the web of lies he’s weaved that keeps her from knowing her true size or even her age. 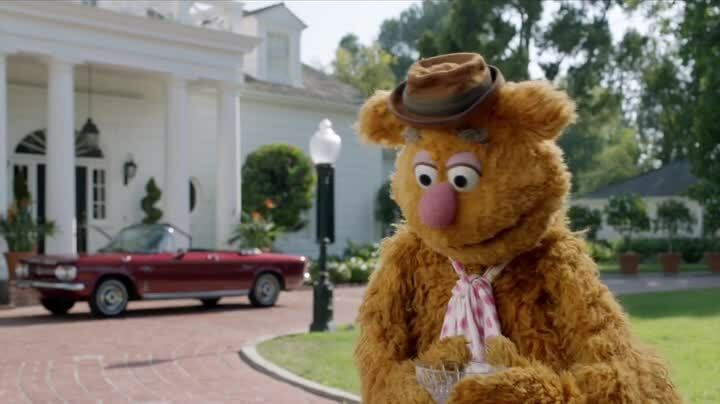 Big Mean Carl gets a good line, and the Electric Mayhem supplies more than their share of adult jokes, including Zoot’s picture on Sweetums’ birthday card that he tries to change into a saxophone. 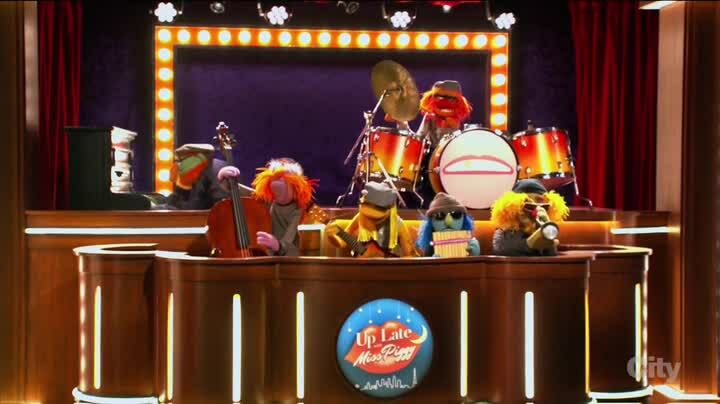 At one point Miss Piggy makes them be an acoustic band, which results in a perfect punchline a bit later. And her rant about libraries was hilarious and something I’d expect some idiot to seriously argue some day. The solution to knock out Groban was awesome and makes perfect sense in-universe. 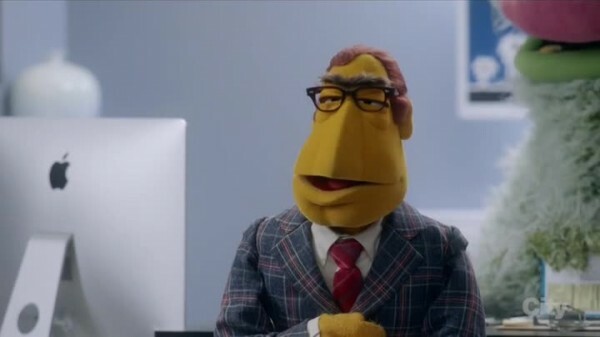 There is even Kermit admitting that Miss Piggy was the only female late night talk show host, a statement that (as we noted last week) is sadly true for now. Kermit’s management of this crisis is in sharp contrast to his management disaster last week. I should note that Denise was nowhere to be found this episode, meaning maybe he’s better off without her? 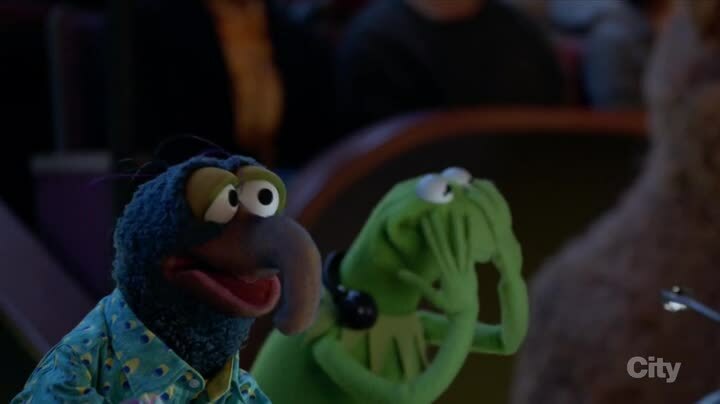 With the Muppets being more real fleshed out figures, Kermit mentions that he and Piggy had a list of celebrities that were their fantasy free passes, including Lea Thompson on his list (and she shows up in the episode, only for the moment to be ruined by Gonzo!) This sort of thing is perfectly acceptable on Friends, but could be seen as controversial here. 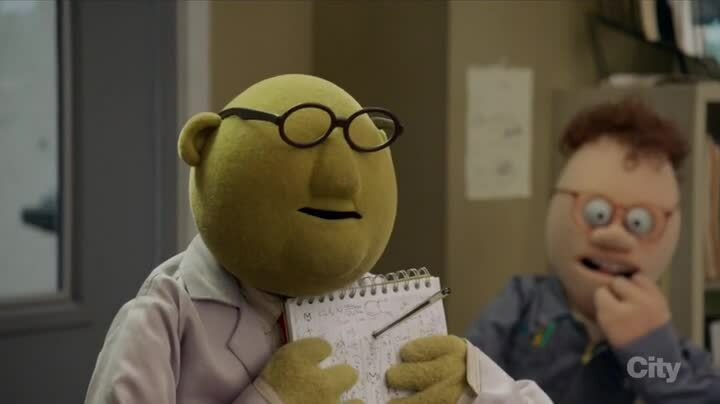 I am fine with it, because to make the show work at all, you got to have the personalities be relatable and three-dimensional, or it will just feel like a cartoon. Then you can throw in the wacky stuff. A healthy mix is what The Muppets should be searching for, and this episode got the mixture pretty much correct. It was gas station sushi. If they keep it up, the show should be on a good track.